I once rode across America on a Greyhound bus, from the laid-back city of Portland, through the deserts of Utah and back up through the Wild West to the industrial heartland of Chicago and Detroit, then onto Toronto and my Uncle’s spare bedroom for a week of recovery. I learnt two things on that trip, all five days of it – firstly, spend as little time as possible in the bus station in Detroit in the middle of the night, and, secondly, it’s hard to eat well on a moving bus. We survived on a bag of fruit from a market in Portland and whatever we could pick up on the way, mainly fried chicken and Subway sandwiches. It really comes to something when ‘the healthy option’ is a Subway. I knew then that this wasn’t the State of the Nation, that there was more to America’s food than I could see from the bus window. We’d seen as much in the wonderful markets of the Pacific Northwest, in Seattle, packed with glistening salmon and seafood, some of it in flight, and we saw more later on the East coast, in Boston, with its clam chowder and Italian food. There’s more to American food than meets the eye. 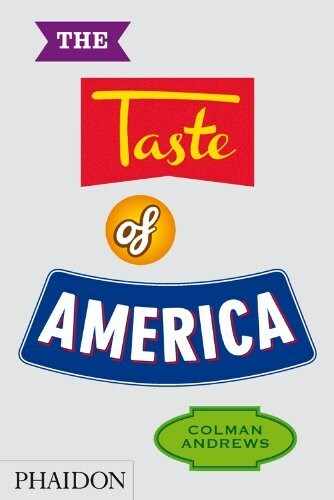 There also seems to me to be no such thing as ‘American’ food, rather an intoxicating concoctions of other cuisines, mixed and mingled together to create something that, when viewed as a whole instead of as component parts, becomes truly ‘American’. tackles this conundrum head on, describing two hundred and fifty foods that are thought of as quintessentially American. Colman presents a series of short and entertaining essays on ingredients and dishes, such as Graham crackers, pretzels, grits, watermelon, pastrami, hot dogs, bison, beef jerky, Copper River salmon, Dungenesse crab, key lime pie, and jelly beans. There are plenty more, and you might notice a theme in that many of the items considered aren’t ‘American’ at all, but all have found a home there, found a way into that great nation’s cuisine and culture. , the reason why a food is important, why it has a place in the country’s consciousness and history is to do with the way that it reflects how people live and what’s important to them. This isn’t a cookbook. There are no recipes here. Instead, it’s an encyclopedia of small things, a collection of the little things that make up the nature of the food that people eat, and form the basis of the culture of the country that they come from. There’s no better reflection of the diversity of this great nation than can be found in its cuisine, and Andrews captures this perfectly. It’s an easy, accessible and entertaining volume, and one that I’ve dipped into often in the weeks I’ve had it, just quickly reading a page or two, a couple of anecdotes, or illustrations. It’s got a certain ‘Americana’ feel to it. It’s a superb book. A book that sounds well worth reading Rich, good review. Food and culture are indeed closely connected. From what I can see, American (which includes Canadian) food is a sub-set of English cooking (with of course various admixtures), since our culture is based on British settlement originally and the English language and heritage. Some truly regional cuisines exist which developed under a different cultural basis. For example, some of Quebec’s dishes are derived from its French roots. You get a southwestern fusion cuisine where Mexican or other Latin-based influence is strongly at work. But in the main the foods derive from a British basis and ways with cooking. Grits means grist, it is a corn mush which but for the different grain was similar to various porridge-type dishes made from oats or wheat. Chowder and other seafood share a common Atlantic base. Beef, game, chicken, lamb are prepared here in ways familiar to any English person, I believe. “Biscuits” are close to scones, our cooked breakfasts are to this day virtually identical to British ones, our confections, pies and cakes in the main very similar. To be sure, the cuisine is salted with influences from different places: pizza and pasta, German frankfurters (although the English brought sausage in general here), hamburgers are examples. These have now penetrated Britain so you get a similar internationalization everywhere now. But to about the 1980’s, I’d think the food traditions of North America and Britain still showed, and yet to this day, close connections.